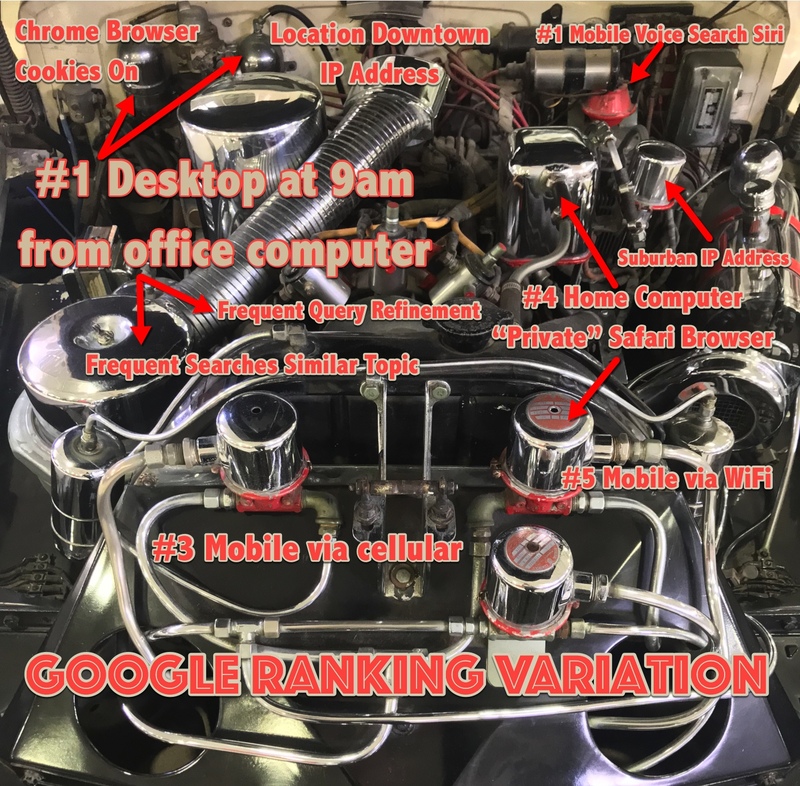 I was recently asked about apparent discrepancies in search ranking between search results an individual sees at work and those compiled and presented in the monthly business SEO reports. In assembling the list of reasons for those differences, it occurred to me that many people may wonder exactly the same thing – so I’ve put the most common factors together in a brief list. This came up repeatedly for me while working with a nationwide web team from 16 large cities and several saw markedly different search results when we all did the same search query. They each compared their own results to monthly SEO reports presented on conference calls and saw variations for those queries that were most important in their own market. What makes Google show different results to your search queries than they provide from their own Analytics data? There are several things to consider to fully comprehend (apparent) rankings – outlined below. Google cookies your searches and improves things you click on frequently (for you only). Try using a “Private” browser (Safari) or “Incognito” (Chrome) to avoid skewed results. You should see rankings most first-time infrequent searchers would see. Rankings fluctuate day-to-day routinely and are different for mobile and desktop. So the rankings will vary by device, your IP address, your location and time of day. The rankings in the report show a previous month averaging those 30 days only. Because they change constantly, Google gives average for the time period selected in Analytics averaged across all device types, locations and browsers. Google “RankBrain” AI varies live results for user testing. Sometimes they vary results by including videos, image carousels or news results, depending on the query. Sometimes carousels are inserted above everything “Position Zero” and sometimes they are further down the page. Google incorporates user click behavior into results, especially when you return to refine your search query repeatedly. You’ll note they can be different when you search from home and different if you use your phone on a cell connection vs your phone connected to your home wifi. There are many more reasons rankings may differ. Ultimately, it varies by several positions on the list Google data is an average for all devices, locations, internet providers and times of day. This is an interesting area to test because if you control for each variable, you’ll see how each is affected when in combination with others. Cell phone, at noon, from work, connected to wifi – vs.the first three variables the same – but NOT connected to wifi, using cellular data. It also changes when you add different browsers into the mix – such as Safari vs Chrome. You may also see different results from an iPhone than from a Samsung Galaxy. The Analytics data averages all variables in rankings for the time period represented in the month for all users from all devices and locations. It’s possible to filter the analytics data in the Google dashboard to look only at searches done from your location, by users on iPhones, on a particular day. However, because we report on all users over longer periods, that precise data is not as relevant to our entire user base. Mike Valentine consults with business to improve search engine visibility. Contact Us.